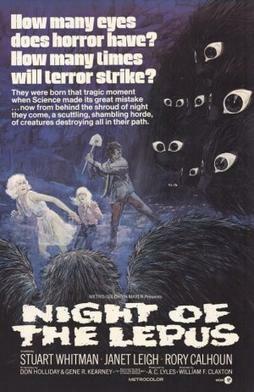 Night of the Lepus (1972) : This movie is based off the book The Year of the Angry Rabbit (1964) by Russell Braddon. It's a science fiction / horror / thriller about a rancher who gets help from a college President to combat a growing rabbit population. They seek to interrupt the breeding cycle by injecting the rabbits with a serum, but end up causing a mutation resulting in man-eating rabbits taking over the town. Peter Rottontail (2004) : A failing magician makes a dark deal to improve his career. It fails and he seeks revenge by dressing up like a rabbit and going on a killing rampage. Classic. Bunnicula (1982) : Okay, this is kinda cheating. It's a cartoon that was on Cartoon Network, and it's based off the classic book. It's a kid's show, with black comedy, so it's not scary, but I love the book Bunnicula and had to include it in the list. For those who don't know the plot, it's about a vampire bunny and his shenanigans. Serial Bunny (2005) : Pretty straight forward horror movie. Every year a serial killer dresses as the Easter Bunny and terrorizes the town due to their lack of spiritual awareness. Oh, and if you like this movie, check out the sequel, or the third movie...or fifth ...Yeah, they made a lot of these so it's worth checking out.